I would be speechlessly grateful ! To keep this thread from becoming a chat thread, please PM me. Just playing with some cache ideas..... I hope to have an engraved Brass plate mounted on the cover, should be here in a few days. File picture of Cache exchange in salt lake city, original Cache started by Po-Sloke in 2008. Last edited by andreas; 10-15-2012 at 10:16 PM. You havent a clue how elated I am that someone took the initiative to reboot the Stromcache . It had been an outstanding means by which other riders have met and become long time friends and riding buds . Me personally , I offer up GI-NORMOUS kudos to Andreas for getting it fired back off . As for the padding in the Otterbox . That some serious hardy glue holding it in . lol . That original box , and the new one sound indentical , will fit perfectly under the seat of the Stroms in the area next to the tool box . You'd think it was made for the VStrom under seat compartment . KUDOS , KUDOS , KUDOS TO YOU ALL . I'm hoping it comes Georgia way sometime and get a chance to ride with it . Anyone coming through North Georgia let me know please . Brass plate came today, I am now 2/3 done. Hope the picture shows up. I am still planning on handing it off Saturday Nov 3rd, if work lets me take off, A new thread will be started in this section, with PO-SLOKE as my advisor, we decided to keep the thread title, just add "revived"
Last edited by andreas; 10-15-2012 at 10:17 PM. If the 3rd doesn't work out, I'll be riding south on the Nov. 4th for a week. Not sure I'll get near Vegas, but So Ut, Az, maybe NM....my plans are liquid. ps. great job getting this rolling again Andreas. I nominate you StromMan of the year! Thanks 2mstone I bought a nice 'Parker Pen' today and a little black Composition Booklet for entries. Since I have never done this I'll need some help putting in the first entry, I hope to start a new thread and possible burger run by next week, will also have an eye on the Weather Channel. Cache - what am I missing? anything? Cache - what am I missing? Nuttin... run with it Bro. I'm out for meeting the 3rd. If Tombstone is somewhere South during that week I might be able to strike out and meet him. Bummer ...... I'll try to do a ride up here with the SLC trooper and cache. 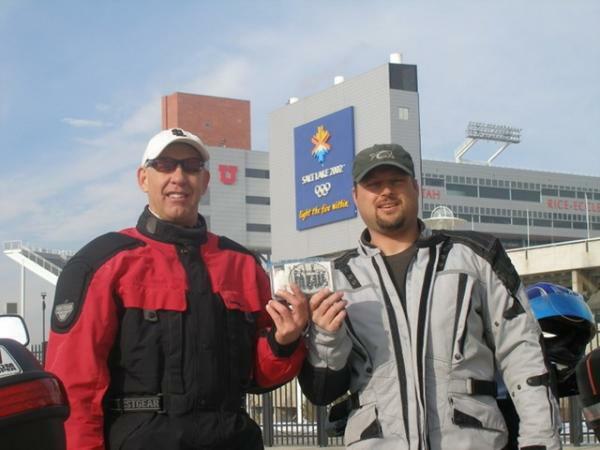 Take a few pic's, maybe even take a pic where we had out 2009 cache exchange - at the Olympic Stadium, . I'll contact 2mstone and see if he can ride on saturday, day before he heads out. The cache is safely in Las Vegas, NV, well actually Henderson but close enough. I met 2mbstone in St. George, UT for a hand off. Looking for someone who wants it next. Any of the AZ or SoCal members interested? Base Camp, notacop?